Errol: Saturday, we gave the master CD to Joseph for replication. Monday, around 4:30, I uploaded the photoshop files for the CD. It’s done. It’s finally, freaking done. After almost a year… the thing is complete. Huzzah! And how goes the server transfer? I don’t know, they haven’t gotten back to me. But the speed of this site is killing me. Whitless: For those of you wondering about whether Errol is joking about reporting his bodily functions to me, that is 100% true….sigh…..in fact he’s doing it right now….while i’m eating lunch….in other news, YAY CD!!!!!!! I am going to buy one and listen to it over and over! You should too! 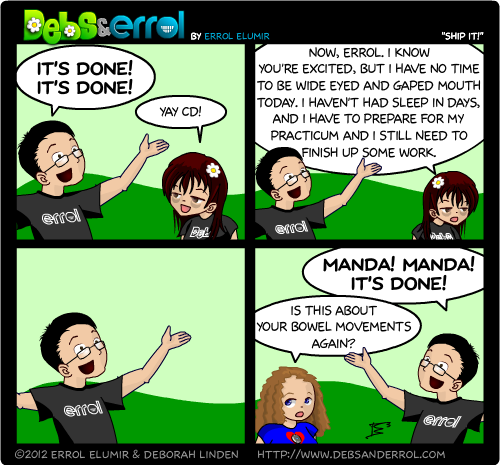 Debs: Errol got a new phone a few days ago and he celebrated by texting me about being on the toilet. Lesigh.